Just wanted to play on my Sony PVM a bit, a couple of minutes into the game the colors got washed out, the picture disappeared. I turned it off, turned it on again: no picture. 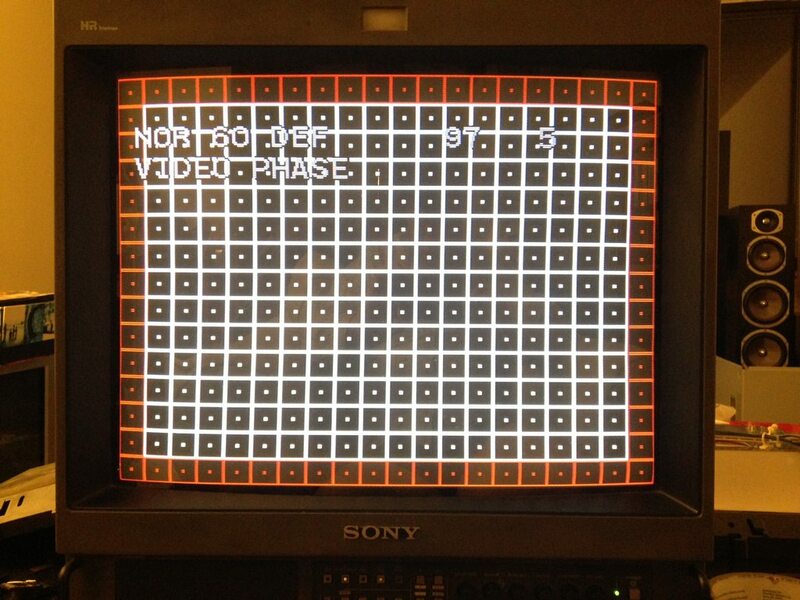 Checked the scart -> bnc cables, nothing. 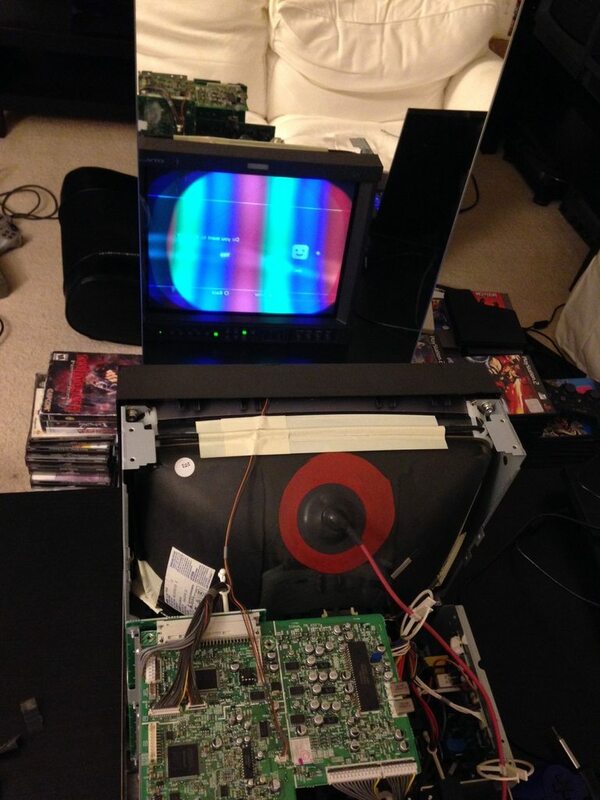 Where on a scale from "That's normal just leave the crt a bit to recover" to "You're fucked dude, stick to emulation from now on" am I? Have you tried with another console? Have you tried with another cable? I tried another console and I tried my SVideo-Cable instead of the scart-bnc-cable. No luck. 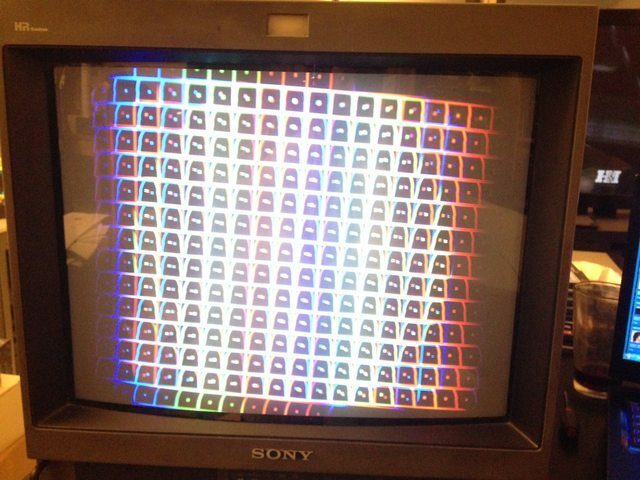 The television recognizes the signal, it ntsc-lamp is glowing, but no picture. What does the screen look like? Black? White? Gray? Snow? i got sick of constantly re-adjusting the horizontal and vertical center plus scaling to my sets and wanted to find a permanent spot for all my sets. since my hdtv (pioneer 151fd) does not cut off any edges of my games in 4:3, i decided to use it to measure shifts in borders of a 4:3 image between the systems i own. but vertical spacing from the top to the bottom edges of the screen to the game are always scaled to fit. basically allowing me to observe and worry only about horizontal centering. using a few games, i used painters tape to mark off end of screen of each game on my pioneer while swapping games in the same system and then swap systems unscientifically. i noticed out of the games i own, the most extreme horizontal shift happened with r-type ps1. The horizontal center is shifted to the left. i also observed identical spacing on the psone LCD screen where the screen is shifted to the left with virtually no space while the right side has a quarter of an inch gap. if you're still following: up to this point, you can see in the pics the behavior of what i'm describing. 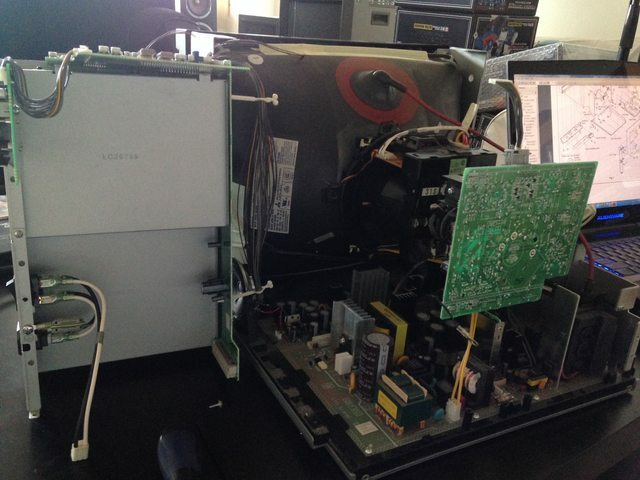 with the psone LCD is a 4:3 with 640 x 480 resolution making it perfect for psone games. 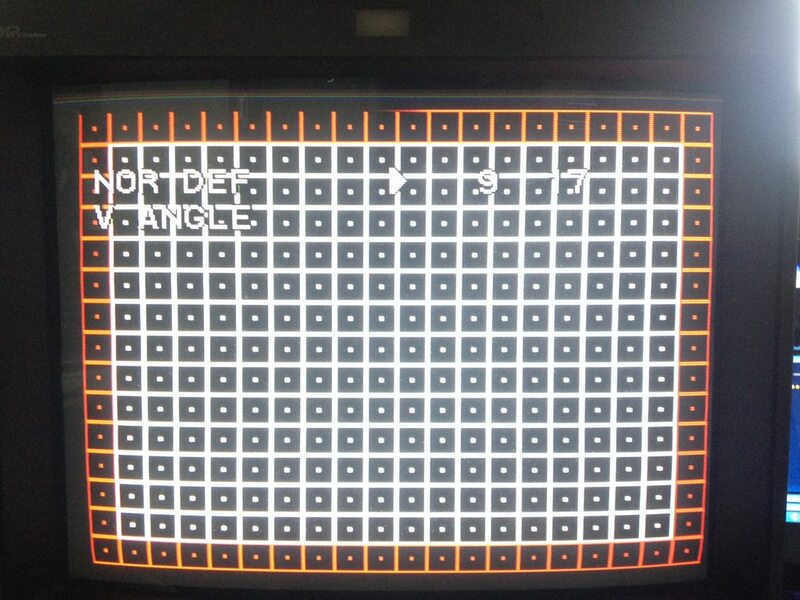 there are no border or scaling adjustments for the LCD and nothing on the screen is cut off and exhibits identical behavior to the pioneer 151's 4:3 mode. and psone lcd with r-type being horizontally shifted extremely left leaving a gap on the right. to compensate for consumer TV's lack of underscan options and often the borders are zoomed in or cut off on the edges of the screen. Games such as genesis sonic, outrun Saturn Layer section in TATE have gaps to compensate for consumer TVs. psx r-type top and bottom edges will be cut off for those sets. 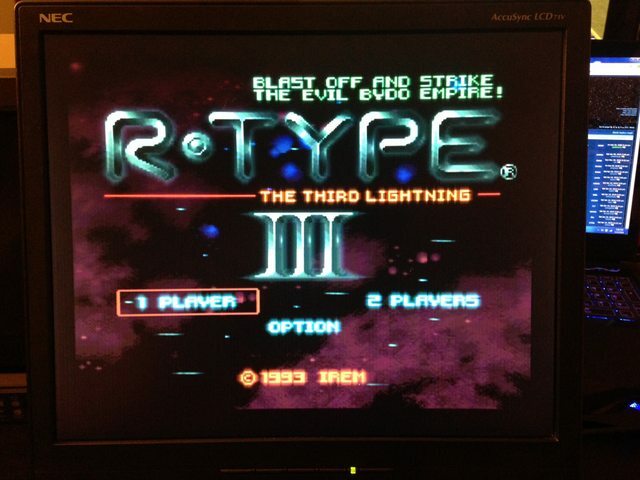 But for PVM and BVM's R-type will use the maximum vertical space allowing no gaps w/o resorting to an underscan option. 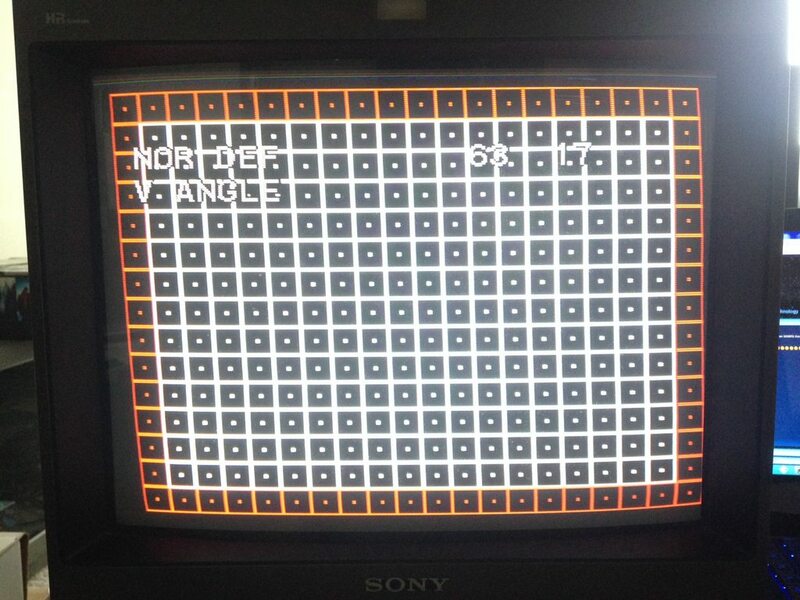 Since HDTV automatically scale the picture there's no issue but for CRT's every game vertical border spacing varies so it is important to find a game that uses the maximum vertical size leaving no space or gaps. all you have to do is find a game that does this which ps1 r-type is one of them. another game that uses maximum vertical borders is psone Raiden II from Raiden project. (set on TATE.) Raiden II uses the maximum spacing available for vertical centering and sizing without the use of underscan. 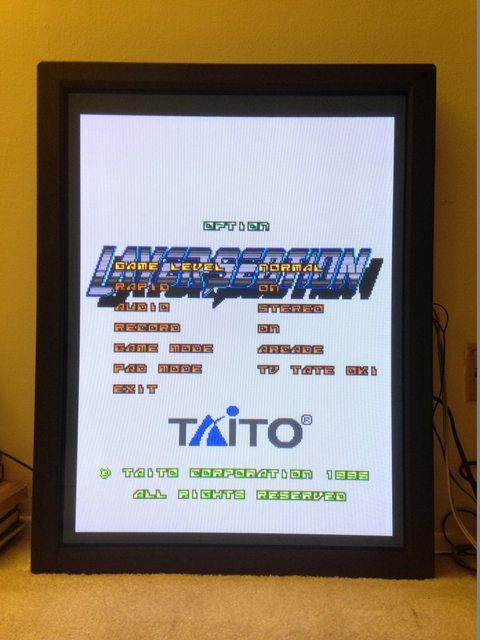 donpachi on Saturn TATE on full 100% scale RGB 0% offset screen setting works as well to set the vertical size limit since it uses the maximum allowed vertical space and will set the vertical center nicely. to test this: i used it on the pdp-v402 which has vertical centering setting only but no vertical scaling options to vertically stretch or shrink the picture. 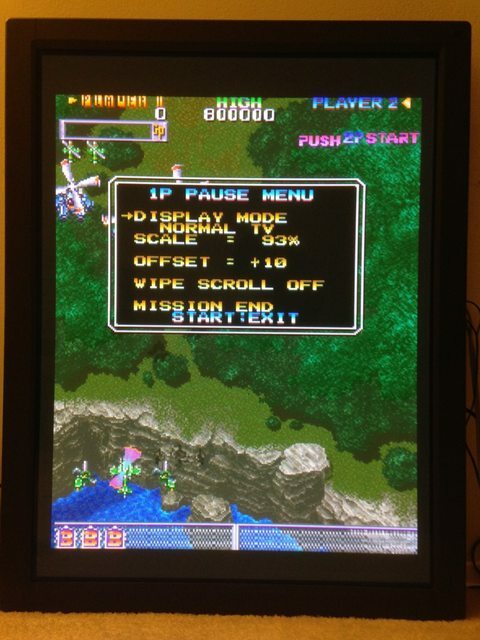 the PDP 402v, similar to the psone lcd and the 151FD, with no vertical scaling adjustment, it's easier to set the vertical center w/o worrying about scaling. all you need is to find a game that maximizes it's vertical screen leaving no space at the edges of the top and bottom of the v402. After setting the pdp 402v, i set all my PVMs/BVMs that have adjustable vertical scaling options in addition to vertical center settings last bc they are more prone to distort the aspect ratio and stretch the image. 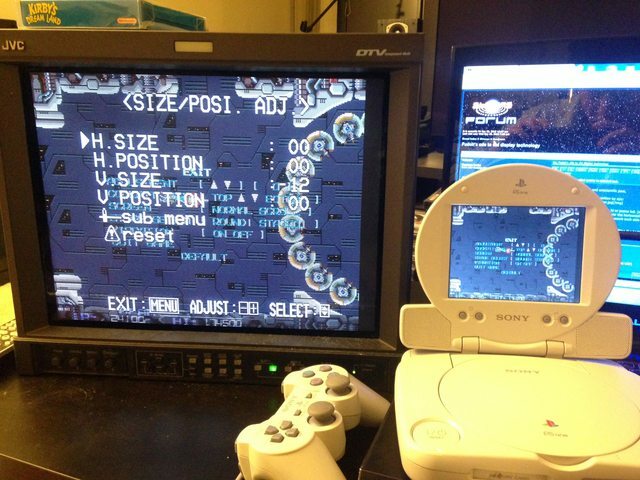 for shifting the horizontal centering setting, i use r-type psone exclusively and set all my monitors. Why? because not only with r-type is it easy to center and scale vertically but horizontally easy find the center. all you have to do is shift the horizontal center all the way to the left of a 4:3 screen until the game screen touches the edge of far left side of the monitor. once that is set the screen will be centered. That game is set extremely to the left by default making centering very easy. the gap on the right side of the screen of r-type to be approx a quarter inch (see picture) if the screen is truly 4:3 it will scale the aspect ratio nicely. use a game that maximizes it's vertical size and you'll be able to center it perfectly. 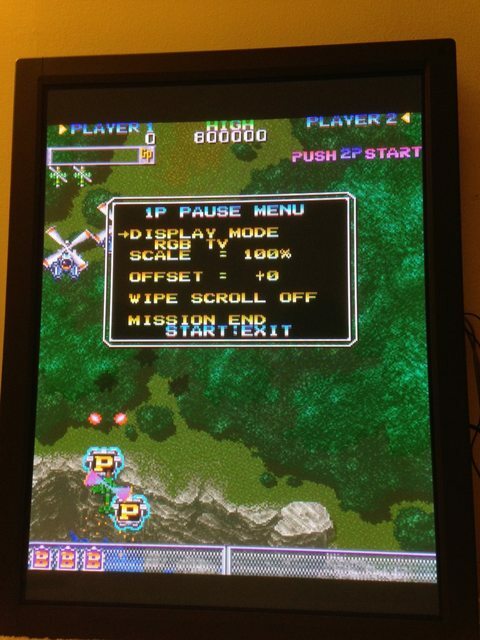 use psone r-type and shift the horizontal center far left till the screen touches the edge without getting cut off. (imitating the pioneer and psone lcd). so three sides should be touching the edges (top, left, bottom) with the right side having a small gap. and nothing will be cut off no matter what game or system i use. and vertically it is perfectly centered for TATE. i'm done rambling but hope it helps someone who wants a good stationary horizontal/vertical centering/scaling without fear of borders being cut off for any game or system without using the underscan feature. Last edited by davidwhangchoi on Thu Feb 14, 2019 7:54 am, edited 1 time in total. A quick and easy way to adjust the H+V position would be an Extron RXI interface, it has toggles that allow you to easily shift the position. You can't adjust size with them though but for H+V position it works really well. thanks! yeah, i have an extron 203rxi and mainly use it for one specific monitor for the SERR. since i got 6 monitors scattered around. I use this setting universally never having to touch the H and V dials again. if any happen to have a copy of psx r-type, give it a try! i grabbed this NEC AccuSync LCD71v locally for 9 bucks. it's not really that good though for 240p. there's some weak vertical jailbar lines for 240p and 480i is so shaky it looks like a JRPG earthquake. Last edited by davidwhangchoi on Thu Feb 14, 2019 7:55 am, edited 1 time in total. Got a kick out of this. That must have been made by someone who was too young or not around back then. The Trinitrons were seen as the top on the pile at the time. Now I've played around with it some more. It seems to have some issues with 576p and 1080/50i. The later doesn't seem to work at all and with 576p the picture is shifted down. Have tried to find a solution but nothing really gets rid of the problem so far. Convergence is rather simple to adjust on this monitor, but what works in 1080/60i doesn't look good at all in 480p and vice versa. In other words I wouldn't recommend having multiple resolutions on this monitor. But when you've got a 1080/60i source, how does it look? Like I said earlier, absolutely fantastic. It has a certain modern feeling, it's what we've all been wanting to get on our current displays. With Blu-Rays, results are near flawless. I've never seen anything like it. If you're in Stockholm sometime and want to see what it looks like, you're very welcome to drop by. For those of you who cannot, here are some captures that may interest you. I possess Sony KW-3200HD HDVS since 8 years. It is a similar model in your but 32". In bluray 1080i the image is fantastic. It's a Japanese model thus it does not make 50hz. 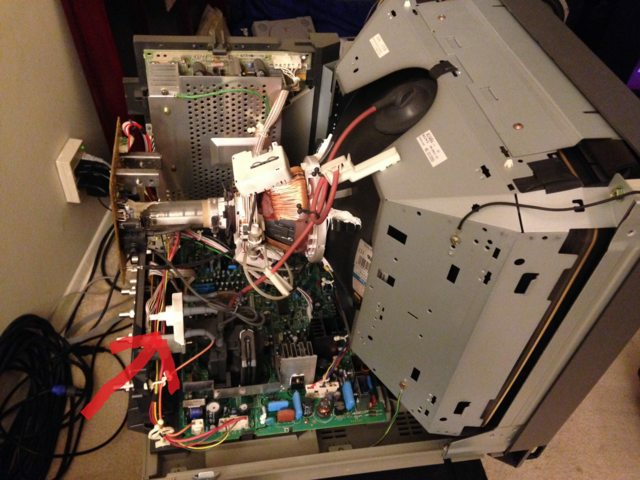 Behind my TV, I have entries RGBHV allowed to connect my PC in VGA 640x480@60Hz to play emulators for ex. the post is old now, but did you fix your problem? got a 20m4u PVM last night. Nice friendly Craigslist-er sold at at a real decent price. spend all afternoon reseating the yoke and got shocked a few times but the geometry is decent now. i prob will redo it one more time next week... after finishing, i noticed there was several button sized magnets taped unto the tube in addition to the strips. i was trying to figure out how come i had trouble getting a certain alignment but it may have been those magnets. i also tried putting my fingers in the wall socket but it wouldn't fit, so next time i'm going try using part of my pizza box to slip it in the socket to see what happens. i actually didn't until last night when looking at a youtuber taking apart his 20m4u. the only other deflection yoke i reseated was a 1710cg and didn't see any magnets. i thought reseating the deflection yoke would help since the top and bottom line was bowing horizontally and needed a reseat regardless. after notating all current settings, i did a factory reset and the v angle factory setting and the v angle was set to 2, similar to the previous user's settings. seems like an extreme default setting. geometry looked pretty uniform with the factory reset but the horizontal line at the top still gets cut off. so then i tried setting all the geometry values to the median. 32 is between 0 and 63 and 128 for 0 to 255 while reseating the deflection yoke but it didn't help. was thinking this might be board/cap issue or just the tube from factory was this way that the service men had to dial in the v angle this way. anyways at least i got the bowing out and pretty happy with it. just might go in one more time next week. found some cool controls after deciding to read the service manual. going to try and turn a few knobs to see what happens! got the geometry close as possible but that red line on top is still missing partially missing. ah well, i can live with it. 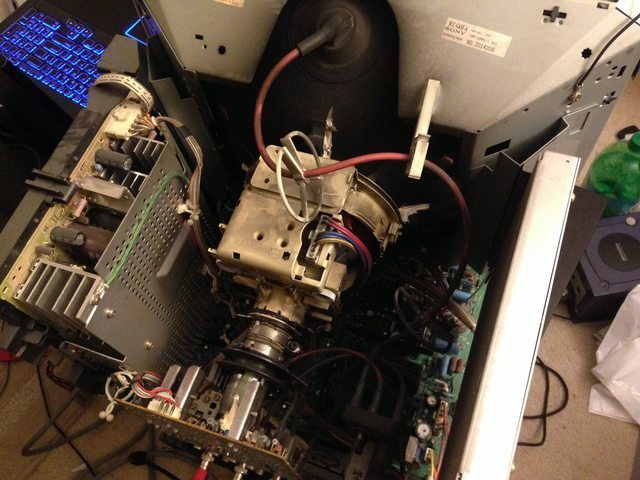 I'm watching VHS tapes over S-Video on a 20L2 and a JVC TM-H1950cg, so 650 tvl vs 800. But I figure that with such a low fidelity source (spec is 230 tvl) that the difference should be minimal. Instead the Sony looks significantly softer. It's seemed this way the whole time I've had it but never really looked into trying to sharpen it. So as an idiot I'm asking - what do I need to do? Also I take it you've tried playing with the Aperture knob on front of monitor? the 20m2u has only a single pot for both horizontal and vertical focus that is separate not on the flyback. 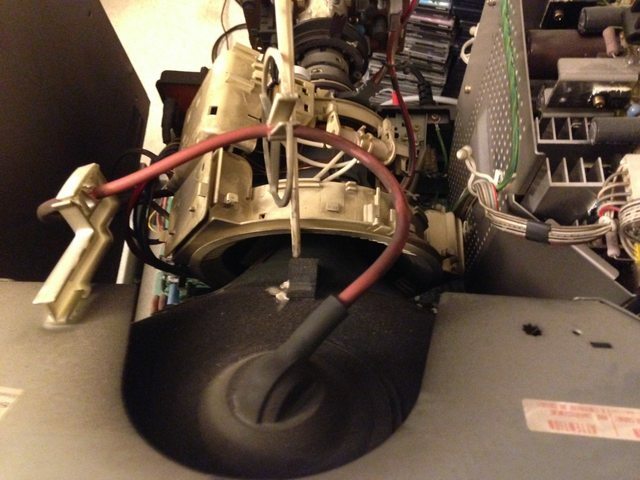 the pot is glued from factory as Sony tech set it and then sealed it so it doesn't move. you prob won't get it much better than it is on the 20m2u. i tried adjusting the focus pot and it was set the sharpest it can possible go from factory. but it doesn't hurt to try. it's hard for your eyes to adjust if you're going from 800 to 600 line tv, esp if you're comparing them side by side. So try not to look at them next to each other. i moved my 20m2u across the room from my other higher line crts and that made a difference. another tip is to avoid putting it too high contrast and making the colors bloom. it'll look blurry. 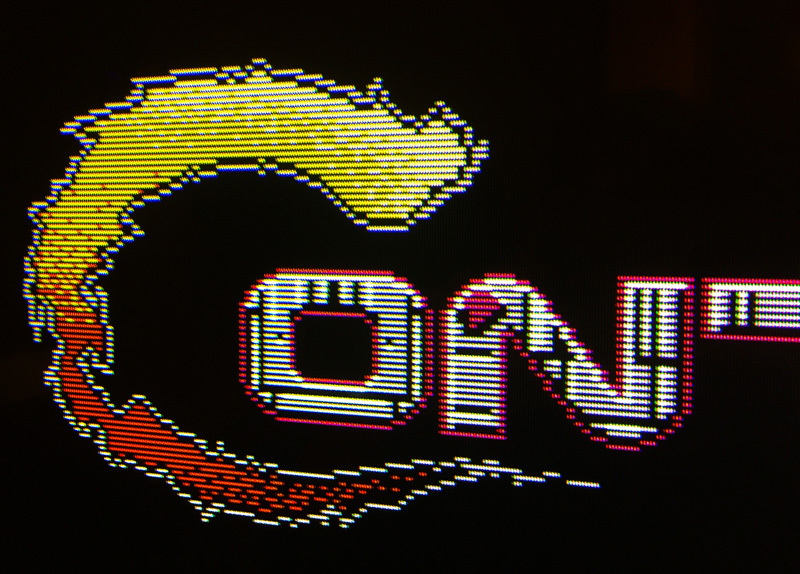 and last, over component or s-video the chroma is usually set too high vs. using the RGB input which is pretty perfect. the colors can easily look over saturated and bloomy which is also another factor making it look less sharp so dial down the colors over non RGB signals. So try not to look at them next to each other. i finally fixed the missing red line!!!! i dropped it on another board by accident and shorted the caps. but i took apart my 2m2u and grabbed the power supply from there and got it working again. i cleaned the tube and ripped off all the magnets, DY stoppers and redid the landing. and... got the top horizontal red line to fully resolve and the landing is so much better. geometry and focus looks real tight on your monitor now david. Great job! That looks awesome! Great job. 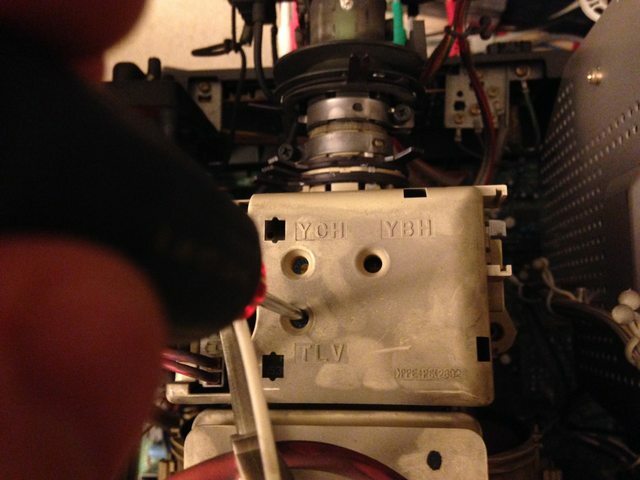 Adjusting the yoke is something I never did when working on the three arcade cabs I had. I've gotten bit by moving near random parts on a CRT that I now try to avoid going near them while on. Also, seeing/hearing power supply capacitors suddenly discharge is quite the experience, isn't it? Heh. 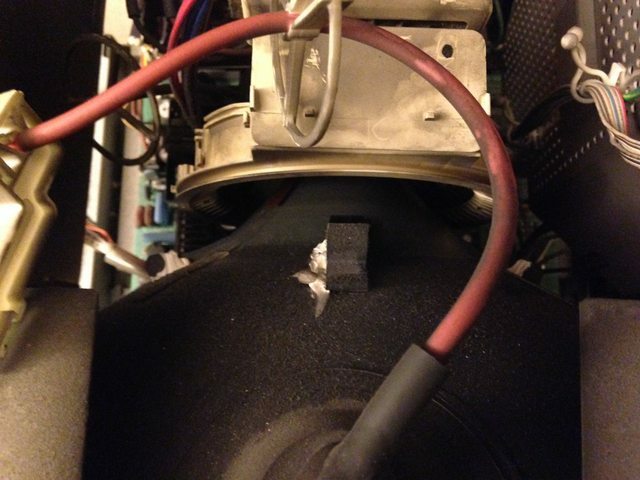 I was trying to repair a subwoofer that was letting out an annoying hum due to aged capacitors. I forgot to flick the power switch on it a few times after I unplugged it before i started to desolder it. I was using braid to clear off the first blobs of solder so I could bend the legs up and use my desoldering gun. Well, as soon as the braid touched both sides of the large filter caps there was a sharp and loud pop and a sudden need for me to do laundry. i tried doing a quick search for a service manual for your model but couldn't find it. yeah i heard the same pop and knew it was dead... i ran off to play some shmups to take my mind off it but remembered my 20m2u had the same board and ripped it off. i need to get the blown caps replaced now for the board i took from the 20m2u. it looks easy to get. i got bit a few times bc i got lazy and was watching a tv show on the flatscreen not paying attention. mostly minor shocks from non dangerous parts but still hurt. 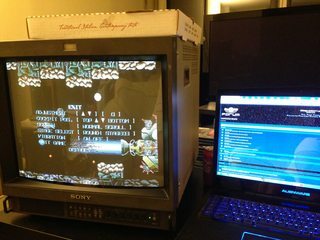 the sucky thing is you need the CRT on to work with the landing convergence... but for the most part, the 20m4u's are really built well and all the parts that are normally exposed are covered up so it's very easy to work with. the JVC 1710cg is the same, it's well covered with plastic housing everywhere so it's decently safe to work with as long as i take the proper safety steps. there were some really nice people on CRT discord that helped me out my first time through. (i left the channel a while ago bc some ill taste racist joke against asians but most of em' are great people) the two mods were very generous with advice and one or two members are also members on here. Thought I'd post my newest find, a 30" Panasonic professional multiformat widescreen monitor, the DT-M3050W. 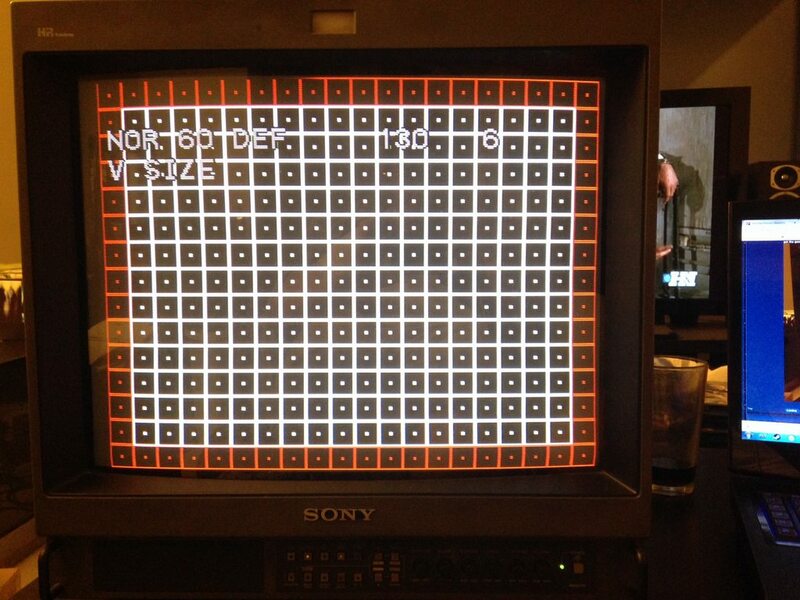 Not as high a TV Line count as a BVM-D32, but it actually has a tiny bit larger viewable area! 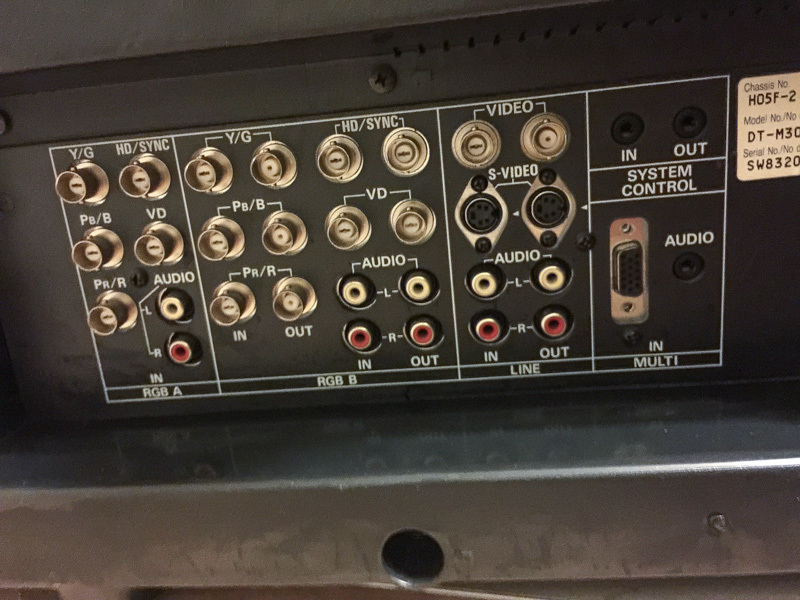 Has something around 550-640 TV Lines depending on the source (kinda confusing on this one, just like the NEC XM29 is 500 or 600 depending on the type of input). Full CV, YC, YPbPr, RGBS (probably RGsB too), and VGA (RGBHV) hookups in the back, and does 240p, 480i, 480p, 720p, and 1080i. Need to get the remote delivered to mess with the geometry a bit (want to tweak the very top a hair, 240p and 720p needs to be centered, and want to get the color just a tad less warm), but honestly extremely good for being from 1998. 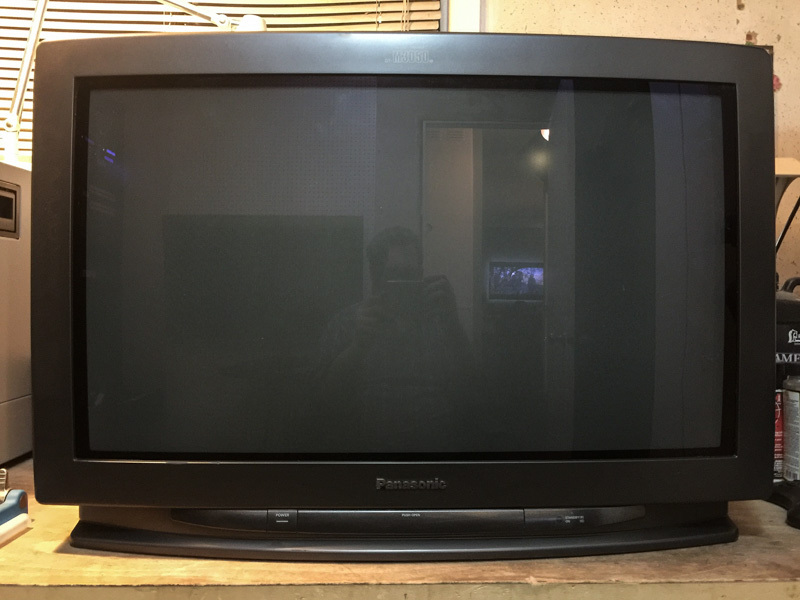 Guy said he got it from Panasonic in NJ before they moved to their new location. What I'm most excited about is how it seems to be able to save SIXTEEN different geometry settings - that's full H and V centering AND centering (and a couple other settings too) - I'm hoping I can save a preset for all my consoles, and for the first time get EVERY one of them scaled and centered perfectly (otherwise you kinda have to setup your CRT to be OK with most consoles, but perfect with none). Been playing 480p OG Xbox in widescreen on it all night, and playing around with Xbox 360 over VGA as well (720p looks pretty amazing so far). 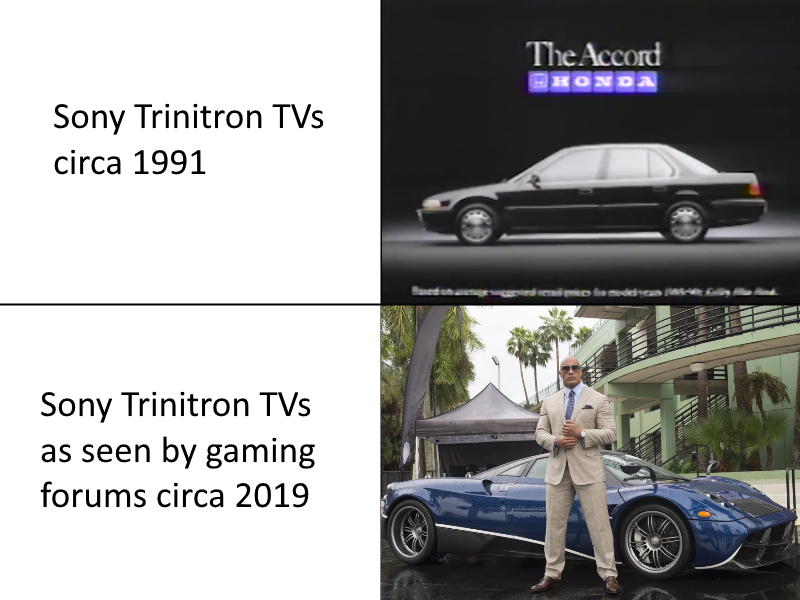 Going to probably use it mostly for the newer 6th-7th gen consoles with the widescreen games, but probably not much for 4:3 content since the huge PVM-3230 (a 4:3 monitor) is right next to it, but it'll probably see some light gun use at least (especially for PS2 system link games, and Dreamcast 31khz lightgun games).